Camden Lincoln Station offers studio, 1 and 2 bedroom luxury Lone Tree apartment homes conveniently located steps away from the RTD Light Rail, off Lincoln and I-25. At Camden Lincoln Station every resident receives an unlimited RTD EcoPass. The open-concept floor plans at Camden Lincoln Station feature gourmet kitchens with quartz countertops, stainless steel appliances and sleek, modern cabinetry with brushed-nickel hardware. Your Lone Tree apartment comes with hardwood-style flooring throughout the kitchen and living areas. Plus, each apartment home has large walk-in closets and washer/dryer. This brand new, pet-friendly apartment community is loaded with lifestyle amenities to give you the best living experience. Enjoy working out in the 1600 sq. ft. fitness center complete with a yoga space and spin studio with virtual training program. Looking for a quiet space with high-speed WiFi? Get all your work done in our e-Lounge with complimentary gourmet coffee. If you love entertaining friends and family, invite them over to spend time in the community's two large courtyards with fire pits, gas grills, comfortable seating, lawn games and even outdoor table tennis. Or relax by the pool and spa, open year-round - all in a smoke-free environment! Looking to entertain indoors? Host your next get together in our resident lounge with a flat-screen TV, fully equipped kitchen, billiards table and more. Head out to do some shopping at premier resorts like Park Meadows Mall, only minutes away. Restaurants, grocery stores, and great retail stores are all within a very short drive. If you feel like going downtown but don’t want to deal with the traffic, jump on the RTD Lightrail, located just steps away! If you are an active Coloradan, you may enjoy the Arnold Palmer-designed Lone Tree Golf Club, less than 10 minutes away, or running the area trails with your dog. If they get a little dirty, not to worry – we have a Paw Spa to get their coats shining again! Plus, Camden Lincoln Station is zoned to Douglas County School District, ranked in the top 10% of Colorado school districts. Lone Tree is one of the best places to live in Colorado. 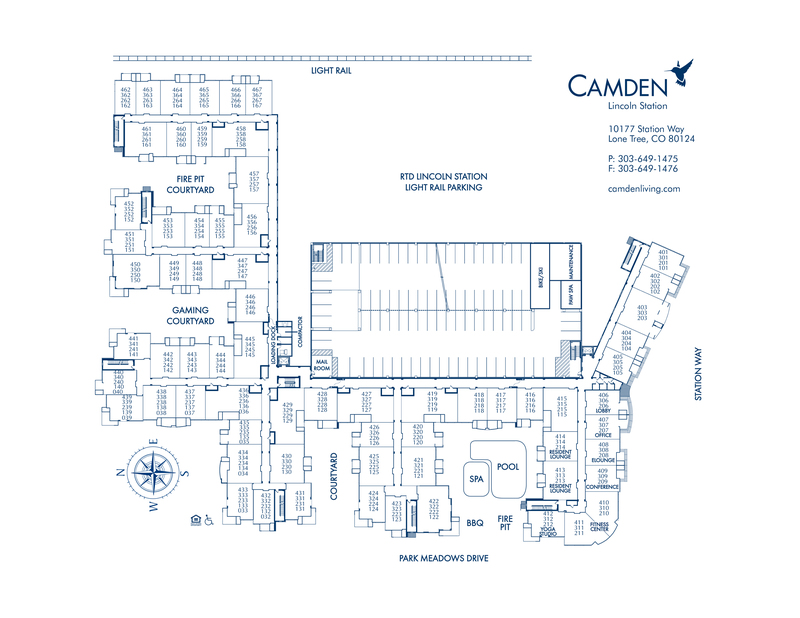 Experience it all by living at Camden Lincoln Station apartment homes! We welcome cats and dogs, up to three pets per apartment, with no weight limit. We offer direct access garage permit parking for residents. Guests are welcome in designated visitor parking areas.